I often find that one of the biggest challenges for any enterprise is connecting the Why and the What to the (right) Who. We may have a great sense of purpose (purpose for us, and purpose for others). We may have a great set of services, products, methods, resources, or materials. We may even have some idea of the people we want to reach. But we may struggle when it actually comes to assessing who those people are when we come face to face with them. We may have trouble focusing on the right demographics to help us be the most effective. And we may have trouble filtering out perfectly nice people who don't fit what we are trying to do. Nevertheless, good strategic planning requires assessment, focus and filter if we ever plan to accomplish anything. 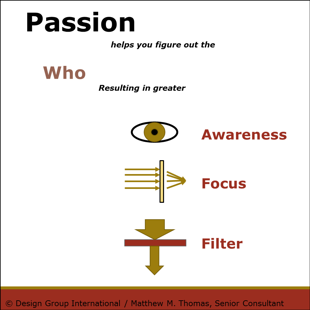 I have struggled with this myself, and to help bring clarity to assessing, focusing and filtering as I need to do, I developed a tool I call the Passion Design Tool. It has helped me tremendously in all three areas, in a short period of time. I'd like to share the process with you today. Choose 5 – 7 areas you find important for your enterprise model and your goals. List the most vital areas you see for connecting your passion and your work. Look for defining demographics. Now, define 4 – 7 categories for each of those areas of importance, representing the variation in how those areas are expressed. Now, rank each one of those items on a 1 – 4, 5, 6, or 7 scale (depending on how many categories you use), within the grid provided above. Order the categories so you can see what your area of passion is. Place each category item in its rank order, left to right. Describe your Primary Passion (1) and your Secondary Passion (2) by naming the category items in priority order. For example, if you think your category #5 is the most important, start by describing there, and move down your priority list from there. That's the basic process. I have found that it works particularly well when our goals are to do good while doing well. That helps us align our personal passions with the needs of others and the greater community. I have created a tool to map this process out on paper, so it's easier to see. The Passion Design Tool is available here. I'm happy to share this version of the tool with you for free!